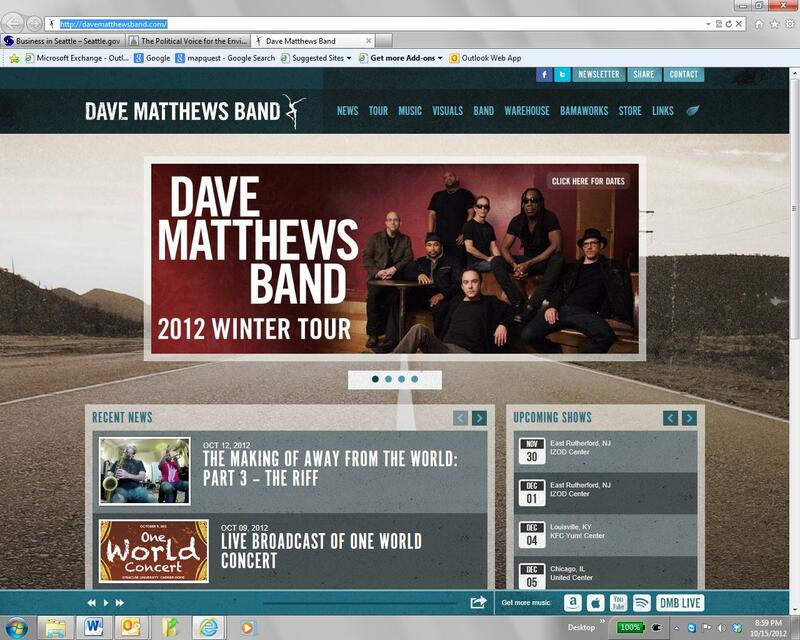 Site name and description: Dave Matthews Band. The web site features a moving billboard that includes tour dates, music videos and merchandise. It is primarily a fan site that provides information on the band including news, tour dates, music discography with options to buy or download the music, band member info, photos, store, links, fan association, philanthropy. Design overview: Background photo is a road, appropriate for a band. The site is packed full of fan-type information, with lots of photos and videos. It’s Interactive, with multiple ways to access music. It’s pleasing to the eye , with a colorful, clean design. Social media integration: Easy to share from home page or from individual music pages. Links include Twitter, Facebook and email and RSS. There are over 2.8 million fans on Facebook. Fans can sign up for a newsletter, share information and obtain contact information. There is not the typical “About” tab; instead it’s called “Band.” Pages under this tab provide a history of the band, separated by year, and details about each band member.